I don’t like making things black and white. 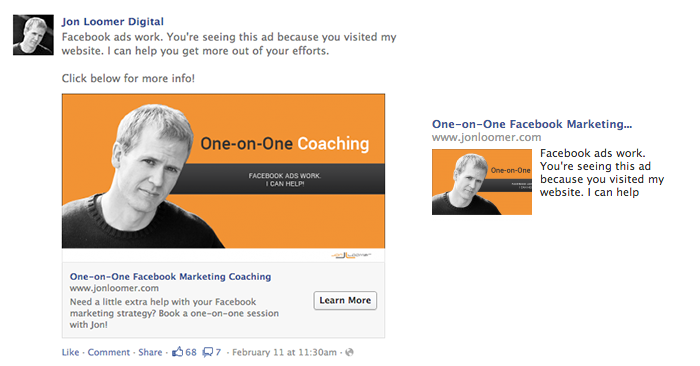 There is a time and place for interest targeting in Facebook ads. But it’s far less central to my advertising than it once was. This isn’t because it’s necessarily less effective than before (though some may disagree since the merger of precise and broad interest targeting). It’s more about the emergence of better options that has made interest targeting less necessary. 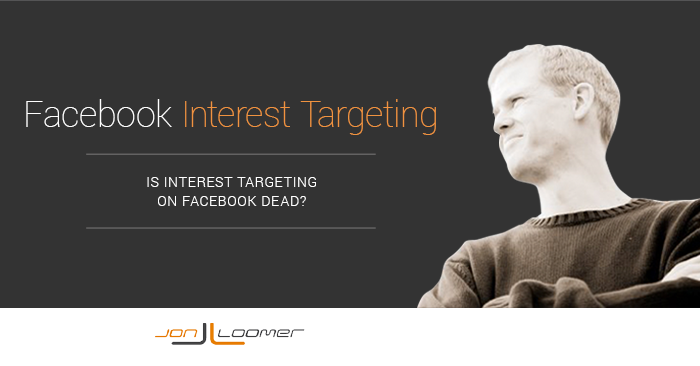 The purpose of this post is to explore why interest targeting is dropping in priority and align the types of targeting you should be using instead. I shouldn’t assume you know what I’m talking about here. When creating an ad in Power Editor or the self-serve ad tool, you’re able to list interests to target. As you can see in this screen grab, this allows me to target “people who have expressed an interest in or like pages related to” particular people or brands. 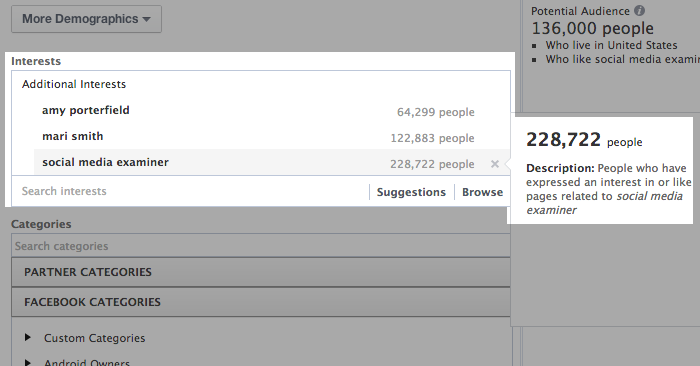 While this does include people who like these pages, it also includes users interacting with them. First of all, the merger of interest targeting (combining precise and #interests) has caused a headache for some marketers. I’ve heard of examples where the potential audience targeted has multiplied as a result. Bigger is not always better in this case. Now, that’s also why it was important to be targeting a very specific interest to start. For example, I was targeting a group of brands that includes Mari Smith, Amy Porterfield and Social Media Examiner. The audiences for those interests changed very little, if at all. But if you targeted something more broadly (like “social media marketing”) you’ve likely seen effectiveness decrease. The second major weakness of interest targeting is that you are putting a great deal of faith in the brands you focus on. You assume they built a highly relevant audience that would be interested in your brand, but what if their fans were bought or brought in through poorly targeted advertising? You guessed it, you may be accidentally running ads targeted at bots and fake accounts. There’s little way of knowing how a brand built their audience, so you take a bit of a risk by targeting it. Interest targeting now only needs to be done when you have no other options. The truth is that you can very easily target users who already have a connection to your brand. 1. Fans: Some will scoff at paying to reach your fans. Such people don’t have a proper understanding of Facebook, and don’t grasp how valuable this group of people can be. Yes, you should pay to build your fan base with ads. Yes, you will reach them organically. And no, you won’t reach every fan with a single post. When you understand how Facebook works, you know that expecting a high percentage of your fans to read a single post is unreasonable. But if you promote it, you can reach more. These are the people most likely to buy from you. I’ve found it time and time again. You can get incredibly high ROI when running ads promoting your product to your fans. Sure, you could just share an organic post to this group. But, as you know, you likely won’t get 10% of your fans to see it organically. So why not promote the post if it is likely to result in positive ROI? 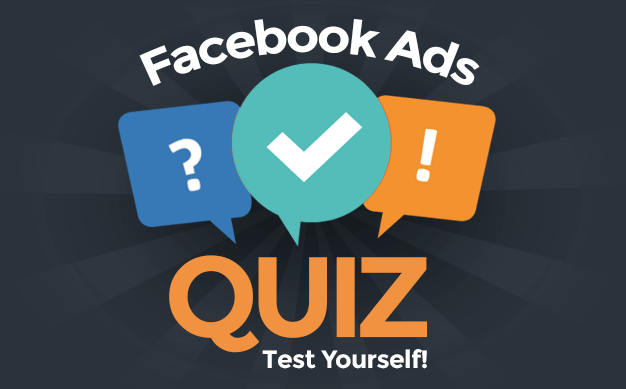 I always scratch my head when I hear a marketer tell me they pay for Facebook ads, but don’t promote anything to their fans. You’re leaving money on the table! 2. Custom Audiences (Email Subscribers): This is likely your most valuable list. This includes not only those who subscribed to your newsletter, but those who bought from you. Create ads that target your email subscribers who aren’t currently fans. Do this to increase your fan base, but also do it to promote posts and sell products. You may wonder why I list your current customers second after fans even though I mentioned this is your most important list. I’ve personally found that fans respond best on Facebook — they expect to see you in their News Feed and provide the most positive feedback. It’s all about context. That doesn’t mean that email subscribers who aren’t fans don’t want to see you. It’s just that, in my experience, this group doesn’t get me quite the response that I get from fans. When you target this group, make sure to exclude fans. There’s no reason to hit them twice. Run ads to get them to like your page, read a blog post or buy a product. 3. Website Custom Audiences (Website Visitors): You have no idea how happy I am that this feature is available. Very few of your website visitors are subscribers to your email list. Or, more precisely, this is the case if you get much traffic from places other than your email list (60% of my traffic comes from Google). As a result, this feature fills a gaping hole. Without it, you could target your fans and email subscribers, but there were still potentially huge numbers of users who read your content but who are not being targeted in your ads. In a little over two weeks, my base Website Custom Audience has nearly 100,000 users on it. That’s 100,000 unique users who have visited my website and are on Facebook. Considering there are only 16,000 people on my email list and about 40,000 people who like my Facebook page, that means there are at least 44,000 new people being targeted who are familiar with my content. And what better group to target when promoting a post than someone who has recently visited my website? You could make an argument that this may be even more relevant than your fan base when it comes to post promotion. The beauty of WCA is that you can promote a post while also excluding those who already read it. That’s being efficient and limiting waste! Of course, you should also target website visitors who aren’t fans and try to convert them. And they are also likely buyers, so you should target them when promoting products. 4. Lookalike Audiences: It’s a very short step from Lookalike Audiences to interest targeting, but I prioritize lookalikes first. If you aren’t familiar with Lookalike Audiences, this is when Facebook generates an audience of users you can target who are similar to one of your Custom Audiences. We can assume they do this by combing through mounds of data that will include interests, demographics and more. The key here is that you aren’t guessing which brands to target. You are using your proven customers or website visitors as the starting point for this lookalike audience list. While I rarely target Lookalike Audiences when selling products, I will target them when building my fan base, promoting an especially popular post or driving registrations for a free webinar. 5. Interests: And that brings us here. As you can see, there are four really good targeting options before you even get to interests. I still target interests, but I put a smaller percentage of my budget into them than I once did. I use Graph Search to help me find the interests to target. And I’ll also cross interests with users on Lookalike Audience lists (users on a Lookalike Audience also connected with certain interests) to make that targeting more relevant. This is mainly for audience building now, though it isn’t as effective as targeting website visitors who aren’t fans. And I’ll also occasionally target people by interests to promote posts. Now, I also understand that the first four targeting types may not always be much of an option. Let’s assume that you just started both your business and your page. In that case, you don’t have fans yet. Your email list is just getting started. And traffic to your website may be nonexistent. That doesn’t change the priority list. That order remains the same. It’s just that you’re going to exhaust that list so quickly that you need to expand the net to grow. This is also why it’s so important to not only build your fan base, but grow your email list and website traffic as well. The more people who visit your website and subscribe to your newsletter, the larger the relevant audience of people you can target. As you grow, more and more of your budget should go towards targeting your fans, email list and website visitors, shifting away from interests and lookalikes. How much of your budget do you dedicate to targeting interests versus the other methods?